Recently Laura Bush was in New Orleans in tandem with the Picturing America project sponsored by the National Endowment for the Humanities. The project involves reproductions of 40 works of art that are available for use in the classroom. Freedom, equality, and similar civic virtues are featured as themes for the collection, which includes works from a range of periods and media. Many will be familiar to adults and none of them are likely to offend the protectors of public morality. Indeed, the lack of a critical edge is all too predictable, which is why this photograph has added value. Dorthea Lange’s Migrant Mother is one of the 40 art works, but here it has become a part of work number 41. This photo of the two students raises many of the questions that could but perhaps would not arise during discussion of the iconic image. 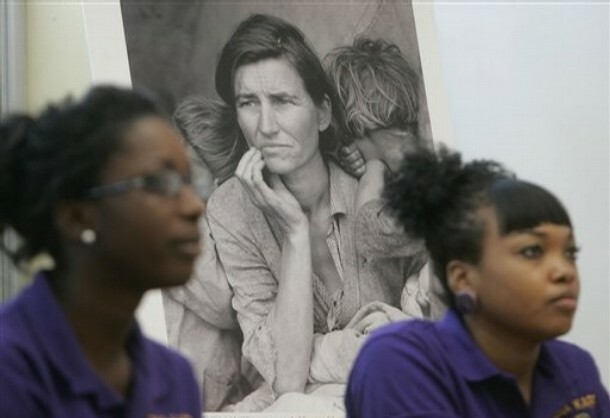 The fact that they are placed in equivalent positions to the two children in the Lange photo makes the point sharply: These are now the children at risk, and they are here, in real time and living color, waiting to see if their government will respond as it did during the crisis of the 1930s. There has been no New Deal for New Orleans, of course, of for anyone else below the million dollar line during the seven years of the Bush administration. Another difference between the two photos provides some consolation, as the two students look attentive and capable rather than wholly dependent. Progress has been made in spite of everything, but that should be no excuse for not having good schools, levees, health care, banks, and all the other little things that once were understood to be the obligations of a good society. Photograph by Bill Haber/Associated Press.